Enriched with acacia honey, wheat protein and vitamin E, it strengthens and replenishes your hair, leaving it with a touchable soft texture and a lustrous shine. TIGI BED HEAD "RESURRECTION" INTENSE REPAIR SET. "REHAB FOR BRITTLE HAIR THAT NEEDS AN INTERVENTION". BED HEAD TIGI RESURRECTION TREATMENT MASK 4 x 15g Urban anti dotes Soften, strengthen and help repair damage done by heat and chemicals, give your a hair a shot of core repair technology to breathe life into looks that are on the brink. Use weekly as an intensive repair to give hair the kiss of life. Spread between hands and apply from the length to the ends. leave in for 3-5 minutes then rinse thoroughly. BED HEAD TIGI RESURRECTION TREATMENT MASK 15g Urban anti dotes Soften, strengthen and help repair damage done by heat and chemicals, give your a hair a shot of core repair technology to breathe life into looks that are on the brink. Use weekly as an intensive repair to give hair the kiss of life. Spread between hands and apply from the length to the ends. leave in for 3-5 minutes then rinse thoroughly. 1 x TIGI Bed Head Recovery Shampoo (750ml) -. 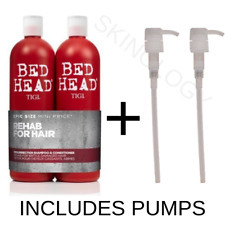 1 x TIGI Bed Head Recovery Conditioner (750ml) -. 1 x TIGI Bed Head Recovery Shampoo (750ml). 1 x TIGI Bed Head Recovery Conditioner (750ml). Formulated with turbo hydration molecules, the shampoo cleanses and continuously repairs, boosting shine and softness. Oatmeal & Honey by Tigi Shampoo 750ml . Bedhead Dumb Blonde by Tigi Shampoo 750ml . Resurrection Conditioner for a powerful intervention Urban Antidote #3: admitting is the first step! Bring dead-end hair back to life once and for all. Formula targets areas in most need of repair, giving your whacked out hair the revival it has been waiting for! CATWALK by TIGI HEADSHOT. RECONSTRUCTIVE INTENSE CONDITIONER. Size: 250ml. Hair is progressively repaired wash after wash. The formula with ginseng extracts, wheat proteins, amino acids, and smoothing agents, help to reduce breakage and split ends. 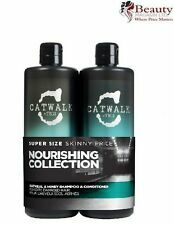 Catwalk Headshot by Tigi Reconstructive Conditioner 750ml Chemically Treated Hair . When hair is highly textured or frazzled, you need an extra helping hand to whip it into shape. Enhances blonde tones and shine. We will resolve the issue as quickly as possible. To use: Apply on clean, wet hair. Leave in for 3-5 minutes then rinse thoroughly. Marke Tigi. Bed head resurrection. Serie Bed Head Resurrection. Produktart Feuchtigkeitsspendendes Shampoo für beschädigtes Haar. Maßeinheit 100 ml. San Marino and Monaco 5,95 EUR. NEW TIGI Bed Head Urban Antidotes Resurrection Shampoo 250ml Urban Antidote #3: admitting is the first step! Making your hair look healthy and smooth has never been so easy! Go back to your roots with Dumb Blonde shampoo, with keratin and milk protein, to help care for chemically treated hair. Colour safe. Perfectly prep the hair for serious pampering, with sensational repair. 2 X TIGI ROCKAHOLIC REPAIR SHAMPOO. 355ml EACH. HEAVENS DOOR. The picture may be of a different size than the one described. For gift sets it may be a different combination of products. The differences are the amount or the concentration of oils that are in the scents. Manufacturer: Tigi. It leaves hair conditioned, soft, frizz free and naturally shiny. It works great on all hair types! Apply sparingly to hair after shampoo. Rub and massage deep into the ends of hair. Huge savings - We have a dedicated team who are constantly monitoring our prices. 07-01-2019 10:44:11. Start the Resurrection. Give hair a shot of Core Repair Technology to breathe life into locks that are on the brink. To use: Use weekly as an intensive repair treat to give hair the kiss of life. Spread between hands and apply from mid lengths to ends. When using shampoo and conditioner vs. non-conditioning shampoo alone. Urban Antidote #2: you’ve dyed, you’ve fried, so take your dull hair to the bright side! Let this potion help strengthen & shine your worn out locks. NEW TIGI Bed Head Urban Antidotes Recovery Shampoo 250ml Urban Antidote #2: you’ve dyed, you’ve fried, so take your dull hair to the bright side! Let this potion hydrate, strengthen & shine your worn out locks. Admitting is the first step! You’ll be addicted to how stunning your hair looks! - Boosts hair shine. - Smoothes the cuticle and calms frizz. -Your hair will feel soft and conditioned. - Colour safe. To use: Massage thoroughly into your hair & scalp and rinse. TIGI Bed Head Elasticate Strengthening Shampoo 750ml TIGI Bed Head Elasticate Strengthening Conditioner 750ml. TIGI S Factor Creamy Molding Wax 1.76oz. TIGI BED HEAD Colour Goddess Oil Infused Shampoo 400ml (For Coloured Hair). Product Line : TIGI S-Factor Serious. Size : 150ml. Type : Conditioner. Experience smooth, manageable and deeply hydrated locks from root to tip. Marke Tigi. Bed head resurrection. Serie Bed Head Resurrection. Produktart Feuchtigkeitsspendender Conditioner für beschädigtes Haar. San Marino and Monaco 5,95 EUR. Marke Tigi. Produktart Feuchtigkeitsspendendes Shampoo für beschädigtes Haar. Bed head recovery. Serie Bed Head Recovery. Maßeinheit 100 ml. San Marino and Monaco 5,95 EUR. NEW TIGI Bed Head Urban Antidotes Resurrection Tween Set: Shampoo 750ml & Conditioner Urban Antidote 3: admitting is the first step! Bring dead-end hair back to life once and for all. Shampoo and conditioner twin-set specially formulated to tackle even the most war-scarred hair. Loaded with Sunflower Seed Oil rich in Vitamin E to effectively hydrate hair. Hair appears renewed shinier & healthier looking. Infused with turbo hydration molecules to boost softness and shine, it will take your hair from boohoo to yippee! 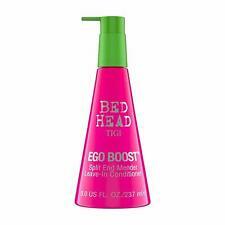 TIGI Bed Head Urban Antidotes Recovery Conditioner dramatically improves your hair’s health for stronger, more manageable hair. 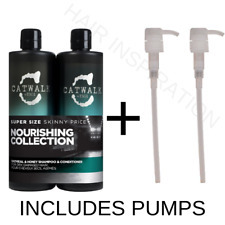 Catwalk Headshot Reconstructive Intense Conditioner (For Chemically Treated Hair) 250ml. A reconstructive conditioner enriched with Aloe. Perfect for all hair types. Can be applied as a hair mask leave on for 5  10 minutes rinse off.